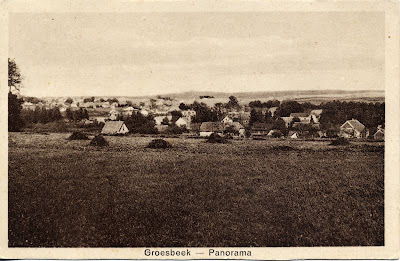 A postcard from Groesbeek, sent in 1928. Groesbeek was (and to some extent still is) a rural village in the province Gelderland, just southeast of the city Nijmegen and on walking distance from the German border (see map). The area saw fierce fighting during Operation Market Garden, destroying much of the village, but the photo on this card was taken long before that.